What Will Your Guests Wear? Traditionally, black tie attire marks a very formal event-takes place in a house of worship or an upscale venue, has an elaborate sit-down dinner and features at least 200 guests and a large wedding party. Brides and bridesmaids wear elegant, full-length gowns (with train and veil for the bride), and grooms and groomsmen wear black tailcoats and pants, white stiff shirts and white ascot ties and black socks and shoes. Invitations are engraved with traditional typeface and wording. Live band or orchestra and antique cars or limousines are usually present. A formal wedding is typically held in a house of worship or hotel, starts in the afternoon or evening, has a sit-down dinner or buffet at the reception and features at least 100 guests. The bride at a formal wedding wears a full-length gown with a sweep or chapel train, and a fingertip veil. 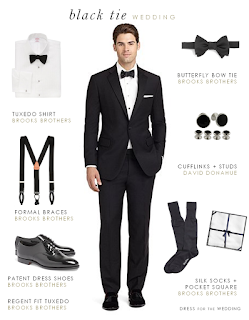 Grooms and groomsmen wear tuxedos. Bridesmaids wear full-length dresses. A semi-formal wedding can be held in a house of worship, but you can also have one in a home, an outdoor location or another spot. It traditionally starts in the afternoon, has a simple meal or refreshments at the reception and features fewer than 100 guests. The wedding party is usually smaller than a formal or semi-formal wedding. The bride wears a full- or cocktail-length gown with a short train or no train at all and a fingertip veil. The groom and groomsmen wear matching tuxedos or dark suits, and bridesmaids wear matching full- or cocktail-length gowns. An informal wedding is usually held during the day in a home or another spot that isn’t a house of worship. It has a simple meal or refreshments at the reception and features fewer than 50 guests. The bride and groom typically have only one attendant. Informal brides may wear a knee- or cocktail-length wedding dress with no veil or anything from a pantsuit to a linen sundress. The men might wear suits and ties or shorts and flip-flops, depending on the occasion. **For informal weddings, you don’t need to add any notation to the invitation. Only black tie and formal weddings need to be indicated.